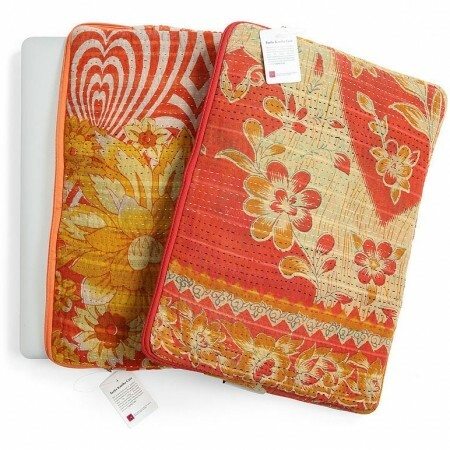 These gorgeous fair trade kantha laptop cases are the perfect way to protect your laptop computer from damage when not in use or while you're on the move, the cases are quilted to give your laptop added protection, and a secure zipper will keep it securely inside. The fair trade cases are made using an ancient local craft known as kantha, which is usually used to make beautiful colourful blankets for the winter. The multicoloured thread used when hand sowing these tablet cases gives each one a unique design. Measuring approximately 38cm x 28cm, the unique quilted cases are a great fit for most modern laptops or notebooks. Each of the hand made cases is available with lining and a zip in two bright colours which compliment the unique designs on the cases. This is a unique, hand made tablet case, the design on these cases will vary from those shown in the images.